"I never wanted that. Even if he had it coming… And he did." 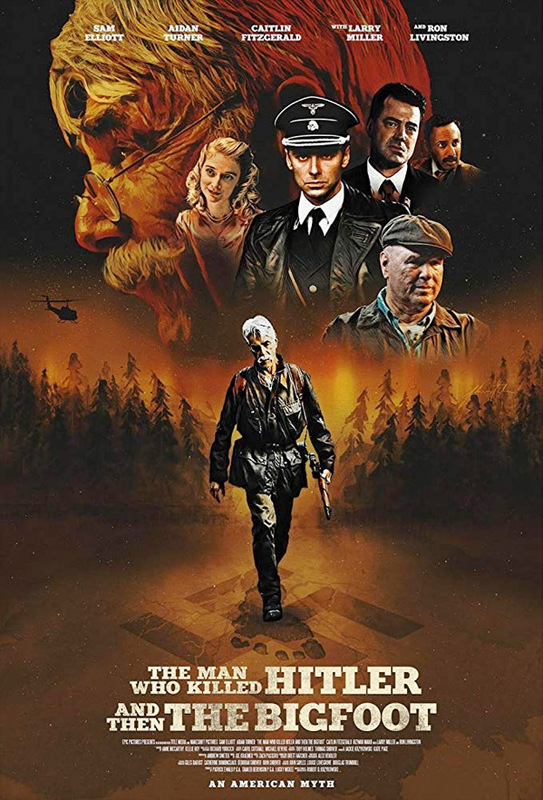 RLJE Entertainment has debuted the official trailer for an indie film titled The Man Who Killed Hitler and Then The Bigfoot, which is one of the best titles for a film in the last few years. This character study is not so much an action film or a thriller, but more of a look at the life of Calvin Barr, played by Sam Eillott, indeed the man who killed Hitler and then years later killed Bigfoot (to save the world). The film is not what you're expecting, but is actually impressive in quite a few ways - Elliott's performance is outstanding, and the cinematography/look of everything is very cinematic. The small cast of the film includes Aidan Turner, Ron Livingston, Sean Bridgers. Caitlin FitzGerald, Larry Miller, Ellar Coltrane, and Mark Steger as The Bigfoot. FS is quoted in this trailer from my glowing review at the Sitges Film Festival. I highly recommend this film, it's really worth a watch. My review: "A gorgeously cinematic tale about a singularly heroic man, who has some oddly unexplainable incredible strength and immunity, now struggling to figure out what his life means as it nears its end." 8/10. Since WWII, Calvin Barr (Elliott) has lived with the secret that he was responsible for the assassination of Adolf Hitler. Now, decades later, the US government has called on him again for a new top-secret mission. Bigfoot has been living deep in the Canadian wilderness and carrying a deadly plague that is now threatening to spread to the general population. Relying on the same skills that he honed during the war, Calvin must set out to save the free world yet again. The Man Who Killed Hitler and Then The Bigfoot is written and directed by first-time filmmaker Robert D. Krzykowski, making his feature directorial debut after a short and a few other jobs previously. This first premiered at the Fantasia Film Festival, FrightFest London, and Sitges Film Festival last year. RLJE will release Krzykowski's The Man Who Killed Hitler and Then The Bigfoot in select theaters starting February 8th, 2019 next month. Who wants to see this one?